The first phase of Pasir Panjang Terminal opened in 2000, and the latest expansion, Phases 3 and 4, was launched in 2015. The port uses technologies, such as automated rail-mounted gantry yard cranes and intelligent systems, for its daily operations. In a move unusual for Singapore's port operator, PSA Singapore is set to incorporate a public area in new facilities being built at its Pasir Panjang Terminal. PSA is planning for a new office building and a staff clubhouse at the terminal, which will include the public space that will "bring people closer to our port", a spokesman told The Straits Times. He declined to elaborate on what form this space will take, but said the move will help raise awareness of port activities in Singapore. The Port of Singapore has traditionally been closed off to the public, although ports around the world are warming up to the idea of engaging the public. "The port plays an important role in Singapore's economy. We want to bring people closer to the port... and showcase PSA's developments," the spokesman said. Construction on the new facilities is expected to start early next year and be completed in 2020. The idea of making Pasir Panjang Terminal part of the community experience dovetails with the Government's vision for the future Tuas port, which will be designed to be integrated with its surroundings and be open to the public. The new mega port, scheduled to open in phases starting in 2021, will consolidate all container port activities by 2040, allowing Singapore to handle about 65 million standard-sized containers of cargo a year. The Maritime and Port Authority of Singapore (MPA) said that it is looking at incorporating cafes, retails stores in the likes of Tesco and Decathlon, and even a jogging track in the Tuas port. MPA project director (next generation port) Eugene Khoo said in a recent report: "We want to develop Tuas as a maritime hub, more than just a container terminal. The idea is to bring life and vibrancy to the terminal with commercial spaces and amenities. People can shop, walk around, and also have food and drinks while looking at port operations just directly below." Number of automated yard cranes deployed at terminals 4, 5 and 6, a scale unseen anywhere in the world, according to PSA. Number of automated guided vehicles test-bedded in live operational trials for Tuas port. Work at the Tuas port has started, while preparations for the big migration are well in progress. But with the new port slated to be operational only from 2021 and fully ready by 2040, Pasir Panjang Terminal is clearly positioned as the centrepiece for the next two decades. Since last year, PSA has begun to move operations from its city terminals at Tanjong Pagar, Keppel and Brani to the newer Pasir Panjang Terminal. All 500 workers at Tanjong Pagar Terminal, for instance, have been moved out, and cranes are being dismantled. The port leases for the city terminals are due to expire in 2027, while Pasir Panjang Terminal's lease will end in 2040. First opened in 2000, Pasir Panjang Terminal was built to raise Singapore's container-handling capacity amid rapid growth in world trade and internationalisation. More was later done to beef up the terminal's capabilities in a mammoth $3.5 billion project, which saw Phases 3 and 4 launch in 2015. A key reason behind the expansion of Pasir Panjang Terminal was to enable the Port of Singapore to better serve mega vessels (massive ships that stretch over 400m in length and hold 18,000 standard-sized containers or more) as well as meet the complex needs of shipping alliances. The 503ha site houses 33 container berths and a dedicated automobile terminal. It received two new mega max container vessels in recent months: the MOL Triumph on April 20, and the OOCL Hong Kong on June 2 - the world's largest container ship to date with a capacity of 21,413 containers. Mr Andy Lane, a partner at shipping consultancy firm CTI Consultancy, said that certain features at the older city terminals, such as land space, shape and superstructure equipment, which were highly relevant through the last three decades, have become obsolete due to changes within the industry. "At Pasir Panjang, you have more symmetrical terminals with deeper and longer berths, and modern equipment - all designed to handle the demand dynamics of today and the future," he said. "So Tanjong Pagar Terminal has served its purpose very well in establishing the Port of Singapore as one of the world's largest hubs, but the future is at Pasir Panjang, and ultimately Tuas." PSA said it continues to sharpen its edge by making commercial arrangements to attract and retain its customers, and ensuring service levels remain competitive to meet customer expectations. The port operator moves over 150 containers in an hour on average for mega vessels, while productivity for its quay cranes, which load and unload containers from ships, has improved more than 20 per cent since the end of 2015. Today, Pasir Panjang Terminal is the main South-east Asian hub for shipping lines and major alliances like Ocean Alliance, THE Alliance and 2M. It is also home to PSA's joint ventures with top carriers CMA CGM, China Cosco Shipping and Mediterranean Shipping Company. "From the last round of alliance musical chairs, Singapore emerged as the clear winner in South-east Asia due to a well-planned and executed strategy by PSA," said Mr Lane. "This will help to sustain the port as a major hub for many years to come, although further diligence will always be required as transhipment demand and flows will always be highly volatile." Another vital part of PSA's strategy lies in investing in world-class infrastructure to meet customers' needs - with technology and automation, unsurprisingly, as areas of focus. 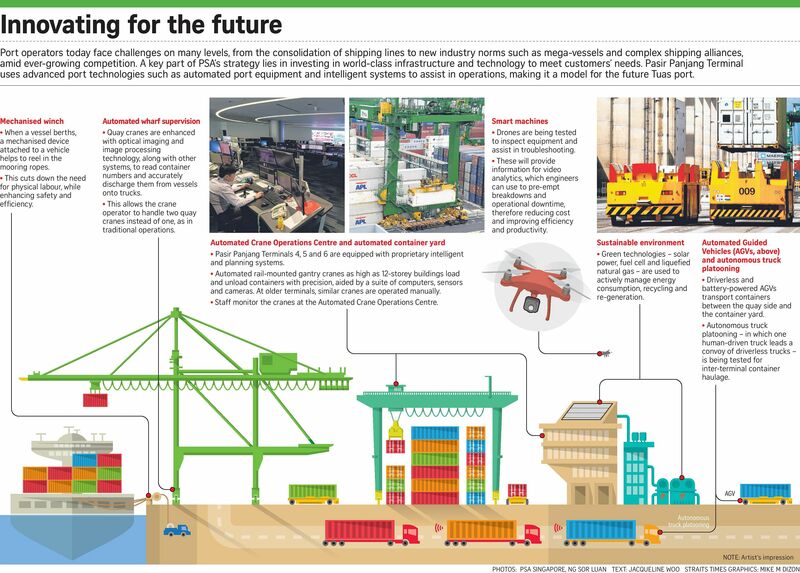 Pasir Panjang Terminal employs advanced port technologies such as automated port equipment and intelligent systems to assist in operations, making it a model for the upcoming Tuas port. The facilities at terminals 4, 5 and 6, for instance, deploy over 144 automated yard cranes - a scale unseen anywhere in the world, according to PSA. These cranes are completely unmanned and monitored remotely from a control centre, which also oversees planning and engineering or technology support. They may be used at Tuas, depending on the technology available then. A fleet comprising 26 automated guided vehicles is also test-bedded in live operational trials for use at the future Tuas port. These vehicles are used to transport containers between the quay side and the container yard without human drivers. The fleet runs 24/7, and will grow to 30 units by early next year. In addition, drones equipped with high-resolution cameras are being tested to carry out inspections for cracks and other weaknesses in cranes, which would save time and improve safety in maintenance processes. "As global shipping alliances make PSA Singapore a major port of call, it cements our position as the world's largest transshipment hub. We continue to develop and upgrade Pasir Panjang Terminal with the expansion of our port facilities," the spokesman said. Meanwhile, PSA International last year unveiled its venture capital arm, PSA unboXed, to invest in start-ups with innovations that PSA can use. PSA unboXed runs an incubator programme with an initial fund size of $20 million that aims to look not only at port technology, but also logistics technology, trade and financial technology. Its latest projects include Hakovo, an online marketplace for companies to connect with shipping lines and logistics service providers, and Haulio, a jobs-sharing platform for hauliers.